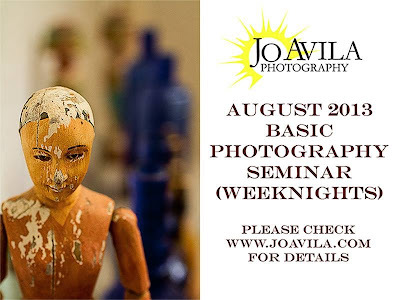 If you want to learn a basic photography workflow from shooting, composing, lighting, post processing to printing, join JO AVILA's Basic Photography Seminar this August 2013. Choose among the 3 sessions: weeknight, Saturday and Special seminars to hone your skills in photography. Sessions 1 & 4 (Basic Principles and Basic Post Processing) shall be from 630pm-10pm. Sessions 2, 3 & 5 (Composition, Basic Studio Lighting and Color Management) shall be form 630pm-930pm. Seminar fee of P6,000/participant for all the sessions..